Deflated balloons hang from a tree outside the entrance to the Los Angeles Times building on July 10, 2013 in Los Angeles, California. NPR is reporting that Tronc - the former owner of the Los Angeles Times - paid its then publisher Davan Maharaj $2.5 million dollars to keep recordings he had secretly taped of company chairman Michael Ferro using a racial slur. Ferro was chairman of Tronc. And he was taped during a meeting in Chicago in 2016 in which he allegedly called billionaire Eli Broad part of a “Jewish cabal” that ran Los Angeles. The story has caused ripples in the LA media circle, particularly in the LA Times newsroom. 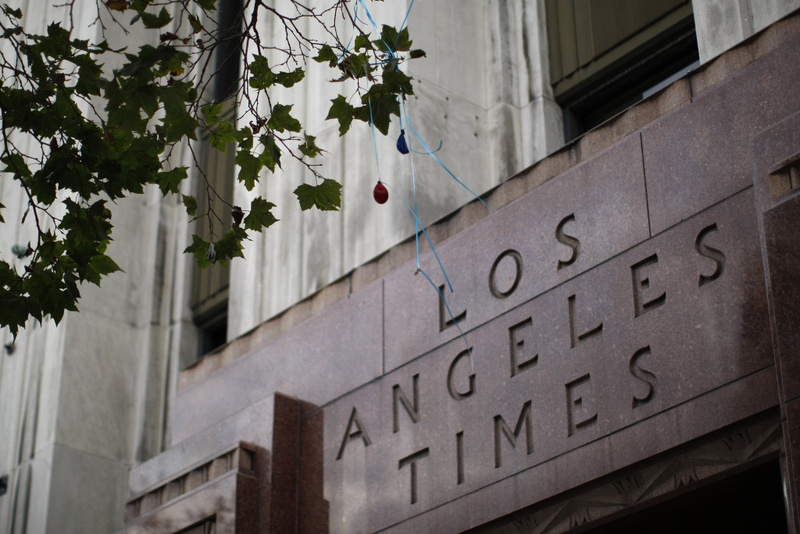 The Los Angeles Times was sold to new owner Patrick Soon-Shiong earlier this year. Here to talk about his reporting is NPR’s David Folkenflik, who broke the story. Read David Folkenflik’s full story here. "I was so very disappointed to read about the distasteful comments made about Eli Broad. He and [wife] Edythe are civic leaders in Los Angeles and they have contributed much in the sciences and the arts to the city and the nation. I am so glad that we were able to take over The Times and the San Diego Union-Tribune. This is behind us now, and we should move forward." We also reached out to Eli Broad, who declined our request. Los Angeles approves short-term rental regulations. What will they mean for you?